Thank you for your interest in Leadership DELI! 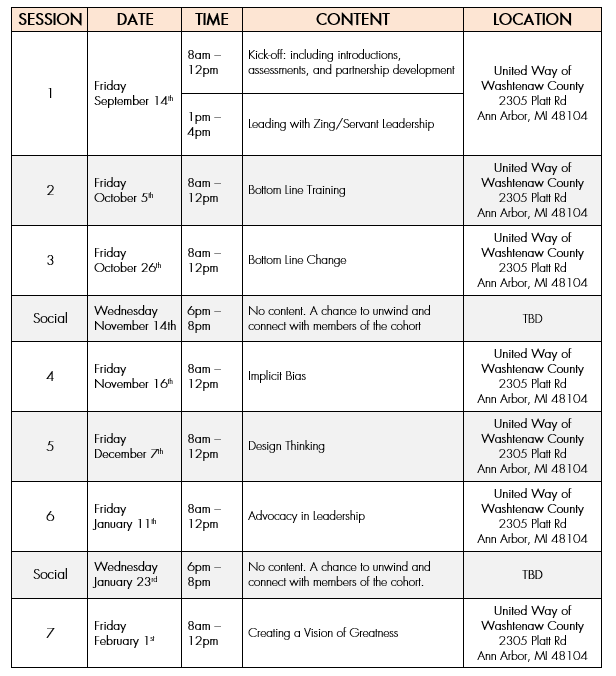 In an effort to more closely align capacity building funding with program operations funding and outcomes, the Washtenaw Coordinated Funders have underwritten a Leadership DELI cohort open only to current grantees. The intention is to strengthen the results of their investments by building the leadership adaptive capacity of grantees. The challenges of leadership training through traditional approaches have been well documented. Leadership training, and the broader category of capacity building, has historically been transactional and difficult to tie to outcomes; for example, there is little noticeable long-term impact that results from a traditional board training or two-hour workshop. Directing support or interventions at individual nonprofits or isolated leaders or boards of directors simply has not addressed the underlying systemic challenges that are present in communities. Moving the needle for nonprofits, and strengthening their ability to implement new leadership models in support of their mission work, is dependent on approaches that take into consideration the interconnections between different players in the nonprofit social ecosystem (including funders, businesses, government entities, management support organizations). Leadership DELI focuses on growth in leadership and organization development, along with the powerful connections that happen when we bring leaders together. Through this collaborative venture, knowledge can be shared and applied in the nonprofit sector that challenges the scarcity mindset and increases the likelihood that nonprofits can more effectively strive to meet their goals. Leadership DELI provides the means for all players in the broader social ecosystem to address leadership challenges of the social sector through a mutually beneficial partnership between the nonprofits, a capacity-building organization (NEW), for-profit business (Zingerman’s), and the funding community (Washtenaw Coordinated Funders). Leadership DELI is a six-month, intensive program. Through this program, participants will benefit from the opportunity to develop both their own personal leadership skills as well as gain skills and knowledge that will advance their organization’s goals. Each organization selected to participate in Leadership DELI will be afforded the opportunity to send one or two representatives from their organization. In previous cohorts, organizations were asked to send one representative to all seven sessions and had the option of sending a different staff/board member (the "rotating" representative) for the second seat. Based on feedback from previous participants, the design of the program has been revised, and organizations are invited to send two consistent participants to all of the sessions. Regular attendance by the same participants builds a stronger cohort of participants over the duration of the program. In completing this application, please note that the Leadership DELI selection committee encourages participants to attend all seven sessions, not missing more than two. The curriculum is comprehensive, and later sessions build off of the content of earlier sessions. Please note that we have also included a kickoff session at the outset of the program. During this session, participants will review their organizational goals, set personal leadership goals, and be introduced to the entire cohort and their own triad of accountability partners. This session is designed to set the tone for the cohort and to initiate the exploration of critical questions related to leadership development. The remainder of the program will be facilitated sessions based on the topics listed below. Throughout this program, participants will be asked to implement what they have learned, do some “personal reflection” in between sessions, and connect with their accountability partners to debrief the content and further reflect on the materials. Participation in the Leadership DELI is supported with generous funding from the Washtenaw Coordinated Funders. While program participants of other cohorts incur an organizational fee of $1000, this cost has been completely covered for CoFU grantees by the funders. Information gathered in this application will remain completely confidential and only members of the Leadership DELI Selection Committee will review the submissions. The Selection Committee is looking for an intentional mix of diverse nonprofits in terms of leadership, life cycle, operating budget, years in operation, and geographic location and scope. The committee will use a rubric based on this criteria to guide the selection process. This rubric will take into consideration the thoughtfulness and detail with which the applicants respond to the items soliciting a narrative response. Thank you for applying. We appreciate your candid responses! For a list of the workshop descriptions please scroll to the end of this survey. * 3. Have you participated in Leadership DELI in the past? * 4. In what year was your organization founded? * 6. How many people currently serve on your organization's board? * 7. How many people are currently employed in part time and full time positions at your organization? * 9. Which area best describes the focus of your organization's mission? * 12. Are you or your organization currently experiencing a significant challenge that might hinder your ability to fully engage in this program? Examples of challenges could include embarking on a major capital campaign, facing a leadership transition at the CEO/ED level, addressing a major legal or financial crisis, etc. * 13. How might Leadership DELI benefit your personal leadership development? * 15. Please choose one or two of the Leadership DELI sessions detailed below and tell us how you believe they will impact your organization. * 16. Are there any additional comments about your organization that you would like to share with the selection committee? Thank you very much for taking the time to fill out this application. Kick-off Leadership DELI by meeting the cohort and engaging in a conversation surrounding the goals and objectives of both you, individually as a leader, and your organization as a whole! At this session, you will get a good idea of the good work to come, meet your accountability triad, and solidify your aspirations for this program. Friday, September 14 (afternoon) - Session 1: Leading with Zing! Zingerman’s Innovative Leadership Techniques. 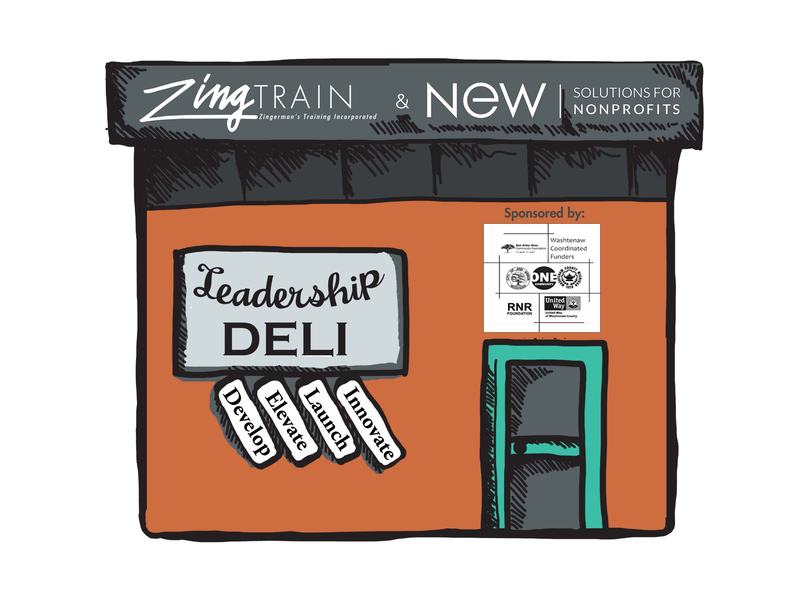 Strong leadership and innovative management practices have been key to Zingerman’s success. In an era of increased competition and a very tight labor market, a positive company culture and identity, together with an inspiring vision for the future, can have an enormous impact on customer and staff loyalty. The focus of the session will be on developing individual Action Plans of positive leadership changes that participants can implement in their home business or department. Participant workbooks will include samples of tools and training materials used at Zingerman’s. We call it Bottom Line Training ® because it’s not just training for its own sake or because it’s the right thing to do – it’s training that is designed to positively change behavior. This is training that enables your organization to succeed and helps your trainees feel successful. We’ve worked long and hard to distill our learnings about learning and share them with you in this seminar. Once you’ve assimilated Zingerman’s Training Compact and our Training Plan Questions, you will be able to create training that works for your business. We believe in our approach so strongly, we’ve trademarked it! Some people love change. Most people don't. Delving deeper into the reasons that some people love change, one is likely to discover that they're (p)referring to being the creators of the change, rather than the recipients of it! No matter which change camp they fall in - most people are in agreement that change is challenging. Creating it. Having it "done to" you. Making it stick. Helping it work. Change is challenging. At Zingerman's we've learned that there will always be change to deal with and so we came up with a recipe for change - one that we can teach, practice, refine and reuse. We call it Bottom Line Change®. We use it to roll out all the changes in our organization - no matter how big or small they are. Whether we're moving the office printer or opening a new business we've found that using the Bottom Line Change recipe makes it a lot less stressful for all involved, a lot more likely to stick and best of all, it gets the people in the organization rooting for its success! Inclusion, equity and diversity are not just moral imperatives they are values that great leaders see as imperative to their organizations success. Explore how organizational performance and community impact (e.g., issues around governance, executive leadership, community engagement, effectiveness of programs) are tied to these principles and what you can do to act or accelerate on this work in your organization. We'll discuss topics of unconscious bias, operating at a high level of Diversity, Equity, and Inclusion (DE&I) at all ranks, but especially on the board and at the executive level, compensation and pay equity, clear advancement pathways + mentoring/support and mutually beneficial and respectful relationships. Feel free to share and brainstorm barriers you're experiencing to achieving these greater levels of DE&I and possible interventions to address these barriers. This work is best achieved when we understand our roles as Individuals in promoting greater DE&I in our organizations, so come prepared for some personal development too! Make time to figure out where you really want to go. Doesn’t it just make sense that if you know where you want to end up, it will be easier to figure out how to get there? We think so too, which is why we are such believers in the power of visioning and why we teach it throughout our organization. Our approach applies on any scale –from articulating the future of your organization in 20 years to figuring out a successful in-store promotion. We believe visioning is why we are successful. Come get inspired. And then get going!